ESEA South Africa Season 28 is drawing to its inevitable conclusion. With all the focus locally being on Bravado overseas, the Vodacom CS:GO Cup at Rush, and the start of Evetech Champions League, ESEA seems to have been somewhat overlooked. Is there anything here to get excited about? Most definitely! It’s a rare opportunity to see South Africa’s best team in Energy eSports play. Considering they don’t take part in VS Gaming’s Masters league and its numerous competitive Legs, we seldom get to see the undisputed local LAN gods in action. Until the reintroduction of the Evetech Champions League, ESEA was the only place we got to see them. 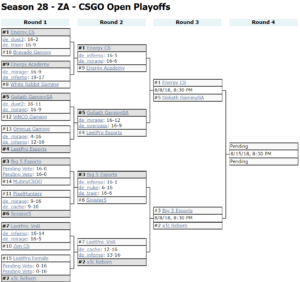 With the playoffs of ECL still some way off, ESEA’s online playoffs gives us all another chance to gauge the relative levels of South Africa’s top teams and where they stack up against this terrifying Energy lineup. ESEA Season 28 didn’t serve up too many surprises during group play. Energy’s only loss was a forfeit to PixelHunters. Only Sinister5 and Big 5 Esports were able to lose with close scoreliness to Energy, so it’s fair to say the Season 27 champions have been relatively untroubled thus far. Energy Academy finished just ninth ahead of the playoffs. They’ve not looked nearly as good in the last few months as they did earlier in the year. Academy qualified for VS Masters but got relegated after only one Leg and have not been as much of a force since. I hope to see them raise their game for the next season of ESEA. LeetPro VNR finished a highly commendable seventh, but weren’t able to beat any of the better teams they faced. They got a good draw and took full advantage of it. I’d like to see them more consistently compete against the true top ten sides. Goliath Gaming managed a disappointing fifth place which is a little surprising. They have had a similarly uninspiring run in the current Leg of VS Masters. Hopefully they managed to fix whatever’s been going awry for them ahead of the playoffs as we’d usually expect them to be just below Energy at the top of the leaderboard. xTc Esports found themselves in second place at the close of group play, with losses to only Energy and Goliath Gaming. Bravado Gaming listed above is the BVD Finesse Academy team, in case you were initially confused. All the results went very much as expected with no upsets in sight. Energy eSports versus Energy Academy was a brutally efficient performance from the champions against their development side. Domsterr and BlackpoisoN were running riot and there was very little Academy could do in response. The Goliath Gaming versus LeetPro matchup was a rather more tantalizing affair, with LeetPro having recently beaten GG in VS Masters. Sadly for LeetPro, Goliath Gaming seemed to shake off their recent malaise and won quite comprehensively. 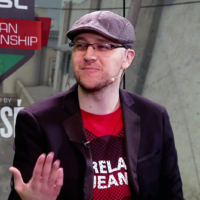 A key factor for them I think was banning Dust II and avoiding a possible third straight loss on the map to LP. Without Dust II, LeetPro were always going to be up against it in the face of the firepower and aggression of the GG side. The battle of the fives. Big 5 Esports against Sinister5 was a strange encounter with none of the maps being close. It went to three maps after Sinister5 demonstrated their superiority on Nuke after being pounded 16 -1 on the Inferno opener. Train was again one-sided to Big 5. Sinister5 are clearly a talented and well-prepared team but are not the finished article just yet. xTc Esports struggled a bit more against LeetPro VNR than I would have thought, with the underdogs pushing them in some close scorelines. xTc will need to up their game ahead of the Semi-Finals. Sinister5 are clearly a talented and well-prepared team but are not the finished article just yet and struggled without in game leader, zerOch4Nce. Both matches will be coming your way at 20h30 this Wednesday, 08 August. First up is Energy eSports against Goliath Gaming. This is a rematch of last season’s semi-final where Energy were completely dominant. Goliath will be hoping for a better showing. Their victory on Sunday night over Big in VS Masters will have given them a confidence boost. Energy however are a scary prospect for any team. I’d call this one a 2 – 0 to Energy, but I hope Goliath will be able to make it close. Their task may be harder still if they’re forced to play with ex-DC veteran stYle as a stand-in for Nef, who is rumoured to be departing the lineup. While he’s performed the stand-in role admirably, it is disruptive to the team this deep into the playoffs to have to make the change. Big 5 Esports versus xTc Esports is next. xTc have not looked great since their big Quarter-Final loss to Big 5 at the Vodacom CS:GO Cup on LAN at Rush. They’ve done well to finish this high in ESEA Season 28 despite a tough Masters Leg and will be highly motivated to get revenge for that beating. Big 5 should by all rights take this at a canter. Their rather surprising loss in VS Masters on Sunday to Goliath might perhaps have dented their confidence, given that their map win on Dust II was so close and their losses on Inferno and Mirage were so crushing. I’ll still call a Big 5 victory, but I’d expect it to be closer than at Rush. I’ll likely be casting the Energy versus Goliath Gaming match on Wednesday, here. I’m rather looking forward to the rematch!